New "words" for a new year! I cannot believe this actually worked! This photo is the first one I have been able to upload to my blog since I apparently "accidentally" uploaded one in my very first posting back in June. Ok, so just what AM I am sitting next to???? These are the first oyster mushrooms that I harvested from a mushroom kit that Santa brought me several weeks ago. The mushrooms took so long to actually "do something" that I figured the kit got too cold on the sleigh and thus was permanently in a holding pattern. However, one day last week, one of these little nubs on the side of the bag started to grow just a bit. Then each day it seemed to double in size. I don't know if we could have let it grow even bigger, but last night was harvest night. What did we do with them? Hmmm, I wonder if I can actually insert another photo here? Oo, oo - I don't think I am smarter than I was 6 months ago. I'll just bet something in this blogging programming has changed to make inserting photos easier to do. 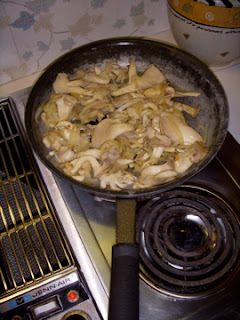 Ok, so you can see than I am stir-frying these mushrooms with some sliced onions and garlic in a little olive oil. I didn't cook them long, just a few minutes to soften everything and make the house smell wonderful. My husband had already made some baked potatoes, still hot and ready to eat. We just split them open and spooned the mushroom mixture over top. Then we served this all-Michigan entreé with a little parsley cut up on top. The mushrooms were grown on the floor in our dining room and the garlic is from our garden. Our home-grown onions are gone so we had to purchase those, but along with the potatoes, we found some that were Michigan-grown. Oops, I forgot that olive oil is not yet grown in Michigan (hopefully global warming will never reach that point! ), but the parsley came from a plant I dug up from our kitchen garden to put in our windowsill for the winter. 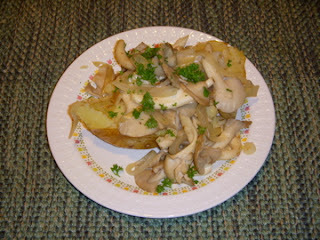 One last photo to see the final masterpiece: the stir-fried whole mushrooms, sliced onions,and smashed garlic, all served over the split baked potato and sprinkled with chopped fresh parsley. Oh, yum, yum, yum. A feast for the eyes and the tummy. This was so filling that we didn't need anything else to eat other than a small glass of wine. We actually only ate about 2/3 of the mushrooms and plan to cut the mixture up into smaller pieces to add to some risotto later in the week. And all from a very small food shed indeed, except for the olive oil and wine. :-) I am not a "strident" locavore, but I am making an effort to shrink both my foodprint and my foodshed by thinking about what I eat, where my food is coming from, and how my choices (i.e., voting with my fork) are helping my local community remain economically viable. What local foods have you found that you enjoy eating? Therefore Earth, Water, and Sun will become part of us. This food is also the fruit of the labor of many beings and creatures. May it give us strength, health, and joy. I see now that there are numerous places on the internet where one can order a grow-your-own mushroom kit. However, I really like that mine came from someone living in SE Michigan who created them to sell at our local Farmers Markets. Having a kit shipped cross country would not have helped me to accomplish my same goal of shrinking my food-shed. I hope you can find someone locally who is doing this, too. I cannot wait for the next batch to be ready to harvest!